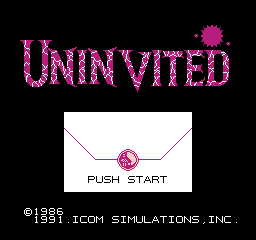 Uninvited was the third and last MacVenture game to be ported to the NES, following Deja Vu and Shadowgate. The cursor moves much faster in the US release. Animation speeds seem to be readjusted for the US release. 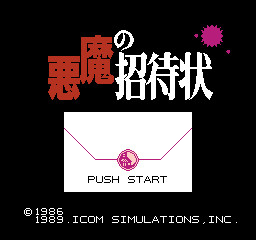 The title screen is a little different between regions. Yep. Upon opening the car door at the beginning of the game, you can now see the ground in the US release. The scene outside the mansion was recolored. The sky was changed from green to gray, while the mansion itself was repainted a brighter shade of gray. The pentagram on the rug in the foyer was changed to an ordinary star. Upon opening the cell door, you're greeted by this fine fellow informing you there is "no escape". He holds a bloody knife in one hand, and his own severed talking head in the other. For the US release, his head was reattached and his knife was cleaned off. How nice. The three photographs hanging up in the master bedroom were redrawn. The wine bottle on the dining room floor was removed. The three buildings in the backyard were recolored. Also the dithered clouds were redrawn. The cross on the altar was changed to a goblet of "celestial water". Also the crucifix in the background was changed to... a "beautifully-crafted ornament"? The weird green clouds hovering above the stone maze were removed. The eyeball dangling out of the zombie's eye socket was removed. Nasty. The cross-shaped tombstone inside the stone maze was changed to a regular-shaped one. The greenish color used inside the laboratory was changed to red. This includes the cookie jar hiding in the safe. This page was last modified on 18 December 2015, at 20:29.